They Came. They Saw. They Took Their Time. Taking part in Slow Art Day in the Freer Gallery. David Nash is program assistant in the Education Department at Freer|Sackler. On Saturday, April 27, ten enthusiastic visitors joined Education Specialist Hillary Rothberg and me for Slow Art Day. Joining more than 250 other museums worldwide, we looked at four objects for fifteen minutes each and thought deeply about what the objects represented and how they were crafted. We examined a third-century frieze that depicts the life of the Buddha and sketched it in the gallery. 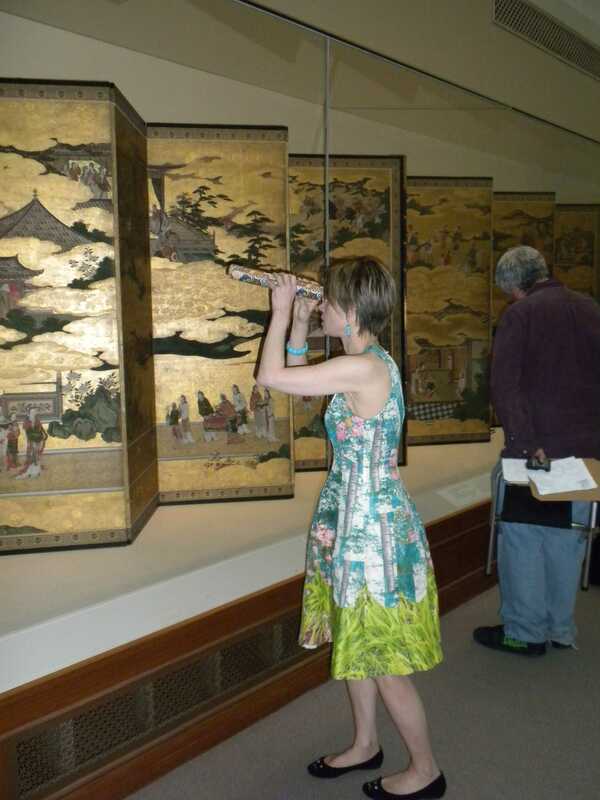 Looking through handmade telescopes, we gazed at ancient scenes of romance and destruction on Japanese screens. We circled four Guardian Kings and looked closely at them from four directions, and we listened to a recording of a piano playing a soft nocturne as we looked upon night scenes from the nineteenth century. After our time in the galleries, we made our way to Teaism and enjoyed a casual lunch, sharing our thoughts on art and what we’d seen over a slow and delightful meal. Everyone expressed what art means to them and how they were affected by the day’s activities. We took our time listening to each other and offering comments. Finally, as lunch ended, twelve newly acquainted friends parted ways. Each went on his or her separate path, back to the normal pace of life. However, with memories of this day as a guide, perhaps each will continue the practice of looking at art slowly. We hope you’ll join us for next year’s Slow Art Day on April 12, 2014! Previous Post Previous Post: Charles Lang Freer: A Wild and Crazy Guy?